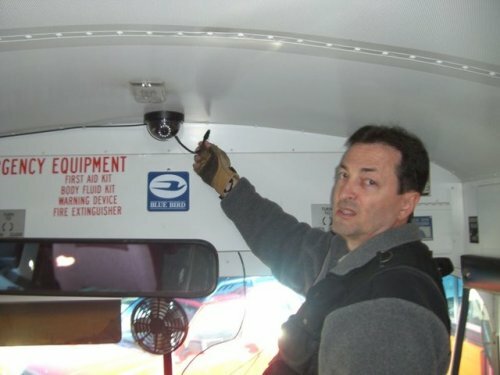 The previous school bus video or vehicle camera systems installer neglected to remove the previous camera power cable, they just cut the cable off so they could removed the camera to make a place for their new camera. These cheap plastic dome cameras are about useless in a digital bus video cameras, vehicle camera, mobile video surveillance systems, digital in-car video camera, in-car camera, bus camera surveillance application as they are unbelievable fragile. Often when we are replacing these cheap plastic dome cameras with our vandal resistant metal case cameras, if the customer does not have the security wrench to remove the camera, we simply smack the soon to be trashed camera with our fist smashing the fragile plastic often completely removing the camera from the ceiling mount, to show others how insecure and useless they really are in a vandal filled application like a school bus.